The Super Soaker XP 90: Pulse Fire, despite its size, can only be classified as a light assault rifle. This is due to the fact that the it is based on presurized reservoir technology. The pump seems somewhat short. The novelty of having this weapon is its nozzle which is interchangeable between a solid and pulsing stream. On stream, the XP 90: Pulse Fire blasts like any other XP-class weapon. On pulse, the nozzle (with enough pressure and water), toggles forwards and backwards, resulting in a pulsing stream reducing one's water consumption. It also sprays a little while firing, but the sprayed area is minimal. When pulsing, the XP 90: Pulse Fire also makes sound which may be amusing, but can quickly give away one's location if on a covert mission. The Super Soaker XP 90: Pulse Fire's size and balance are nice, but its usefulness is questionable. Its ability to fire pulses of water does help one conserve water, yet it is peculiar why Larami Ltd. decided to put this nozzle on an old-style of weapon as opposed to XPs with a separate pressure tank or perhaps even a CPS-based weapon. 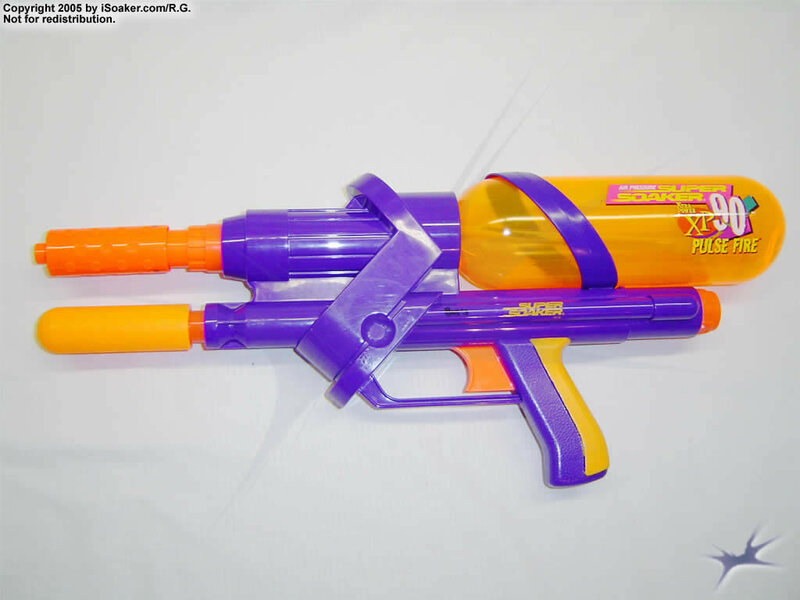 NOTE: Some models of the Super Soaker XP 90: Pulse Fire had to be recalled due to a manufacturing defect in the reservoir/pressure chamber. Affected models' reservoirs would explode if over-pressurized. Be wary when pumping up this blaster. Nice size, light, easy to carry. Despite its size, it packs decent power. Pulsing ability allows one to conserve water if needed or make a neat noise if desired. This is a rather small weapon compared to the others out there. The XP-class nozzle is outclassed by all of the CPS-line of weapons. Its water reservoir is also the pressure chamber meaning one needs to pump a lot to power up the weapon.